(MODESTO, CA) —The Modesto Junior College Speech and Debate team had a successful week at the California Community College Forensics Association (CCCFA) State Championship held March 9 – 14, 2016. The Modesto squad brought home many medals from the six days of competition. The annual spring CCCFA State Championship draws community college students from all over California. 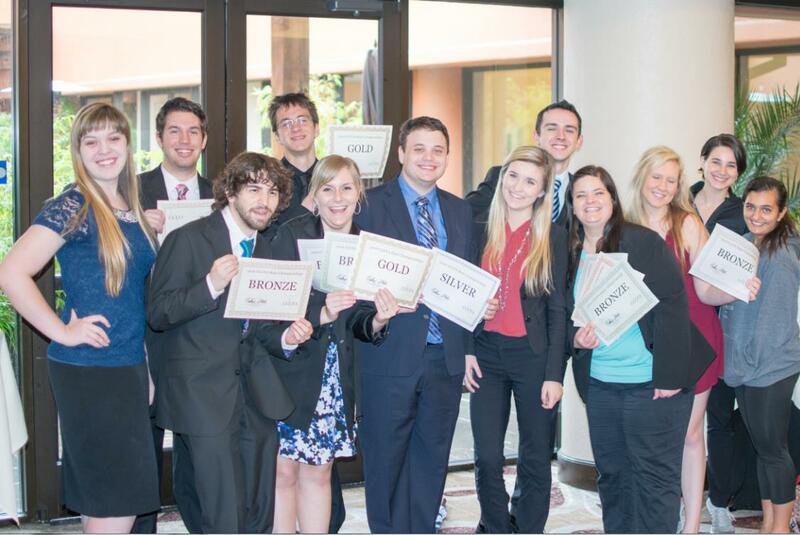 This year the competition took place in Concord, California, and 679 students from 31 different colleges participated in the speech and debate contests. MJC had 12 students qualify to compete in the state championships this year. In debate, students competed in two different categories. Parliamentary debate is a form of limited preparation debate where two debaters from each school are given 15 minutes to prepare arguments on a topic announced at the top of the round. The topics at this year’s tournament ranged from statehood for Puerto Rico to Donald Trump. MJC cleared two teams to out rounds, including new recruits Matt Maki and Sean Cox-Marcellin who took home bronze awards. In the final round Kendall Mead and Cody Peterson won the gold after defeating Palomar College in the final parliamentary debate round of the tournament. MJC students also participated in Lincoln-Douglas policy debate. Policy debate, unlike parliamentary debate, centers around a single broad topic for the entire academic season. Students compile evidence and research in attempts to prove their stance is the right one. This year the topic centered around restricting methods of bioprospecting. MJC students advocated a variety of positions including Antarctic protections and novel methods of safely exploring for antibiotics. Four MJC teams advanced out of preliminary rounds to compete in the highly competitive out rounds. Megan Chatelain, Kendall Mead, and Caterina Grossi all earned bronze medals, while Casey Shoblom took home the silver. MJC team members also demonstrated their talents in speech events. For extemporaneous speaking, students are given questions on issues of international and domestic policy, and have 30 minutes to research, write, practice and perform a seven minute speech. In this event Chatelain and Mead both achieved bronze medals. Chatelain also won the bronze in impromptu speaking, a competition in which students are given a series of famous quotations and have two minutes to write a five minute speech responding to one of the quotes. The MJC Speech and Debate Team will spend the next three weeks preparing for the prestigious National Championship hosted in Costa Mesa, California this year. For more information about the team including travel schedule and results, you can visit their website at www.MJCForensics.org or contact Guy at guyr@mjc.edu or (209) 575-6110.